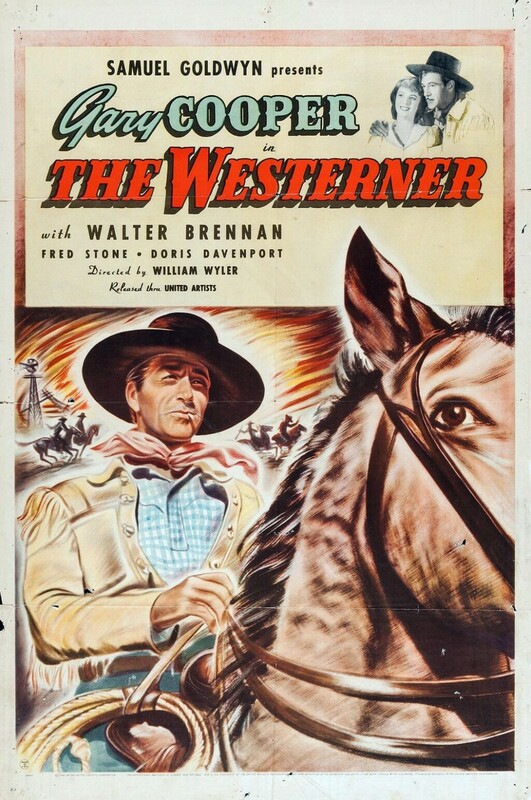 This slow-moving and highly fictionalized biopic about Judge Roy Bean (Walter Brennan, 46 at the time he made this movie) is often viewed as a classic, but it isn’t really much watched these days. 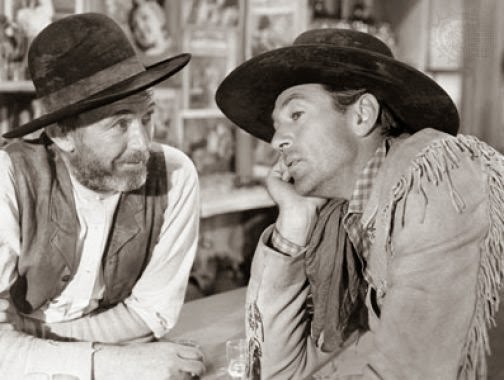 Walter Brennan gives a superb performance in the role of a basically unsympathetic character (Judge Roy Bean, the Law West of the Pecos), and Gary Cooper does well as his friend Cole Harden. In the early 1880s, Harden is brought into Bean’s courtroom/bar in Vinegarroon, Texas, as a horse thief, and is sentenced to hang. Noting the judge’s fondness for English actress Lillie Langtry, Harden claims to be able to get the judge a lock of her hair. 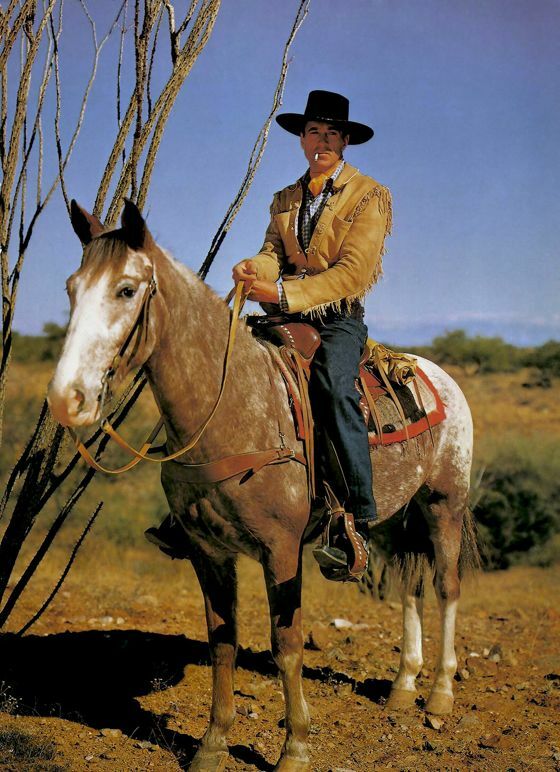 Ultimately, it turns out that he bought the horse from the real thief, and he and Bean become unlikely friends. 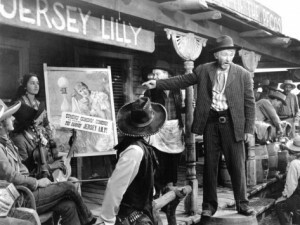 Bean (Walter Brennan) in front of his saloon, The Jersey Lilly [sic]. 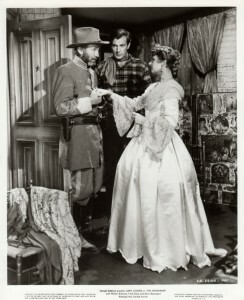 On his way out of town, Harden stops at a nearby homestead, where he is taken with the beauty of Jane Ellen Mathews (Doris Davenport), daughter of Caliphalet Mathews, the leader of the homesteaders generally. While helping them out, he finds that cattlemen have let their cattle into the homesteaders’ valley and won’t let the homesteaders fence them out of their crop areas. Basically, the structure of the remainder of the story is as a range war saga, with the cattlemen led by Bean against the homesteaders. Harden tries to maintain his relationships with both sides and has an idea. He charms Jane into letting him take a lock of her hair. Harden (Gary Cooper) takes a lock of hair from a momentarily compliant homesteader (Doris Davenport). When he tries to mediate between Bean and the homesteaders (after he has taken Bean’s gun), the two sides can’t agree. But claiming that the lock of hair came from Lillie Langtry, Harden gets Bean to promise to have the cattle removed. They are, and the homesteaders proceed to give thanks, until they see that the cattlemen have started fires to burn them out instead. Harden fights the fires with the homesteaders, but Jane Mathews’ father is killed and she won’t listen to him any longer. Most of the homesteaders leave, but Jane is determined to stay. Bean admits that he was behind the fires, and Harden goes to Fort Davis to get a warrant for his arrest; he’s also appointed a deputy sheriff to serve it. Meanwhile, Lillie Langtry (Lilian Bond in a very brief and non-speaking role) arrives in Fort Davis to perform. Bean changes the town’s name to Langtry and buys up all the tickets to her performance so he can enjoy it privately in his Confederate uniform. As the curtain goes up, it reveals on stage not Lillie but Harden. Bean (Walter Brennan) finally gets to meet the real Jersey Lily. The finale is a shootout in the theater, and Bean is mortally wounded. Harden carries him to Lillie’s dressing room, where he meets her and then expires. Cut to the Jane Mathews homestead, miraculously rebuilt in 1884. Harden is there with her as they watch the wagons of returning homesteaders to other farms. Swelling music, fade to credits. Other than portraying Bean’s cranky, arbitrary nature, this isn’t very factual. Davenport is effective enough but a bit stodgy. She never became much of a star because of an automobile accident that forced her into retirement. 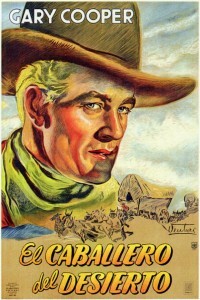 Forrest Tucker is Wade Harper, the younger leader of the homesteaders and rival for Jane Mathews’ hand. There’s an early Dana Andrews role as a homesteader here, too, and Chill Wills. The first half of the movie, while the sort-of-friendship between Harden and Bean develops, is fairly slow, but the pace picks up in the second half. In black and white, filmed on location in Arizona. Music is by Alfred Newman and Dimitri Tiomkin. Although he was quirky as a judge/justice of the peace, the real Roy Bean wasn’t the kind of quasi-criminal depicted in this film. He did fight on the Confederate side at Chickamauga, as the film says. He was not involved in any range wars of the sort shown here, although many Texans were. Rather than dying in a shootout in the early 1880s, however, he died peacefully in 1903, still a justice of the peace. His bar, originally in Vinegarroon, was named The Jersey Lily in honor of Miss Langtry, a famous English beauty, royal mistress and sometime actress, but Vinegarroon itself disappeared in 1882 after the railroad bypassed it. Bean moved his bar to the town of Langtry, Texas, which was named not after the actress but after George Langtry, a railroad foreman. Lillie Langtry did make a profitable tour of the U.S., appearing on stage in late 1882 and early 1883. Although the historical Bean wasn’t much like the character depicted in this movie, Walter Brennan is excellent in the role. In fact, Gary Cooper was reluctant to take the Cole Harden role because after reading the initial script he thought the story would be too dominated by Bean’s character and there wasn’t much for him to do. Brennan won his third Oscar (in five years) as Best Supporting Actor for this role, making him one of only three men to win three Academy Awards for acting. (The other two are Jack Nicholson and Daniel Day-Lewis. You don’t normally think of Walter Brennan the same way as those two, do you?) 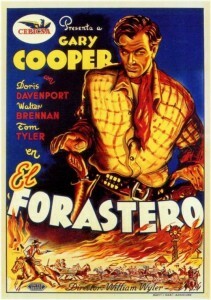 Cooper looked good in this film, and looks particularly good riding a beautiful appaloosa. Cooper astride one of his co-stars; and the central relationship of the movie–Bean (Brennan) and Harden (Cooper). This was shot in just four weeks, with Tucson, Arizona, and surrounding country standing in for Texas. 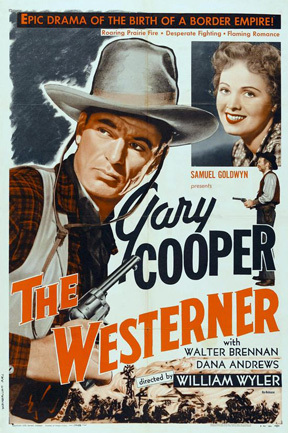 Cooper was at the peak of his career, but he only made three westerns during the 1940s: this and North West Mounted Police in 1940, and the comedy Along Came Jones in 1945. William Wyler did not direct many westerns, but he did do the large-scale The Big Country (1958) with Gregory Peck and Charlton Heston, among many others, almost twenty years later. And Civil War movie Friendly Persuasion (1956), again with Gary Cooper, if you count that as a western. For another (and revisionist) take on Bean and his life, see Paul Newman in The Life and Times of Judge Roy Bean (1972). And another deliberately ahistorical Bean appears in The Streets of Laredo (MfTV, 1995). For another town named Vinegarroon (a type of scorpion, apparently), see Heaven With a Gun, a late (1969) Glenn Ford film with Ford as a preacher-gunman. 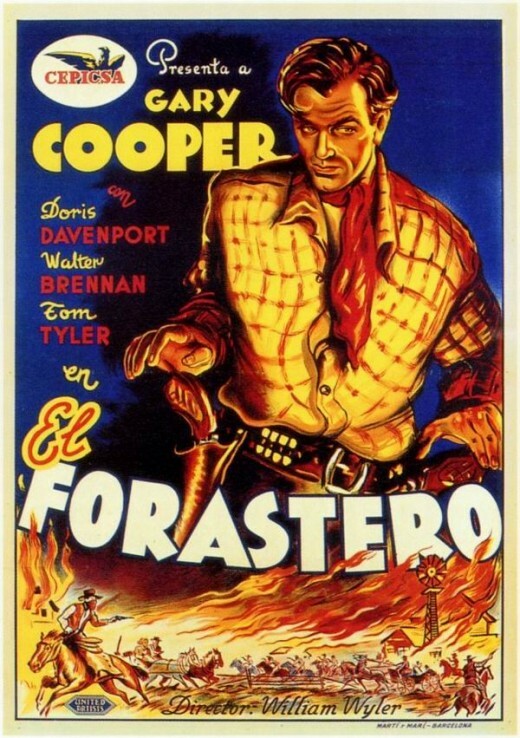 This entry was posted in Westerns Worth Watching and tagged Dana Andrews, Gary Cooper, Range Wars, Walter Brennan on May 8, 2014 by Nicholas Chennault.